Our vegetarian pizza was excellent! However, we did not like how loud it was inside. We would go back because the food was so good. The pizza was amazing and the restaurant was just beautiful. It is an old bank that was turned into a restaurant so pretty with solid wood and crystal chandeliers. Wonderful meal with good apps and pizza. Great bear, whiskey and wine selection. Really cool ambience with old bank redone and love the look. Star does thin crust really well, too -- the mushroom vegetarian version was quite tasty, too. Was seated in the mezzanine upstairs -- really noisy, but not cramped space-wise. Went for dinner with a friend of mine. The decor was lovely - I believe it was an old bank. They were able to utilize the vault doors and chandeliers as unique eye catching design element. Now most importantly...the food and drinks. Sooooooo good!!!!!! I had the all American deep dish pizza- meatballs, pepperoni, sausage and bacon. It took 45 minutes to make and it was well worth it. The pizza was so thick, meats combined was divine and the cheese stretching when cutting a slice was decadent on it own. For two pizza (my friend got loads of toppings which add up), 4 drinks between us, and chicken wings the total was $91. Would definitely come back here but bring your appetite or get ready to take food home! The best deep dish pizza outside of Chicago. Loved my Bourbon cocktail and side of meatballs. Great deep dish pizza!! A wonderful addition to Park Street in Alameda. I like the bar and the service is good in the restaurant. I didn't care for the food in general, just average. Beautiful old bank building restored as a restaurant. Top notch kitchen and service. Great ambience. Recommend for any and all occasions! Service is on the slower side and it took 10-15 minutes before anyone came over to say hello to us. Luckily, the staff members who did eventually help us were really nice and made up for us feeling ignored when we were first seated. Great pizza, friendly and fast service, good ambiance! Yummy food. Great service. One of our favorite restaurants. We thought the pizza was excellent. The thin crust vegetarian we loved. I thought there was a bit too much reduced balsamic vinegar drizzled on it. So, it drowned some of the other flavors).Next time, I will ask for it on the side. I don't like deep dish pizza as much as a thin crust. But, my husband really liked the meatball deep dish pizza. The only thing was the food was a bit slow at coming out. (not the servers fault). The green goddess salad was very good... a bit too much dressing. I would definitely go back. Way too noisy when it’s busy. Even kids complaint about the noise so it’s pretty bad. Otherwise, good is good but no kids menu. Too loud. poor service. Stingy drinks.expensive pizza. Went there several times all of them tried to sit on the upper floor but the waiter never allows us to go up when there is other ppl sitting there. I think they don't get the tips from the upper floor and that is why they make some excuse for us not to go up, won't go again. This is a new local restaurant specializing in pizza and sandwiches. The restaurant is located in an old Wells Fargo Bank building and it keeps many features of the bank without being kitchy. There is great marble work around the vault behind the bar. The vault was open and probably used for bar storage. They have great baked wings, and other items that do not require a fryer. The pizza was great, the salad was very good, and the services was attentive without being intrusive. We had a great table on the balcony and the service was great! The food was good as well. Ambience was nice and it wasn’t too noisy (although it did get significantly noisier during the dinner rush around 7:30pm). Nice place to eat deep dish pizza! It was amazing food and hospitality! It was a busy night but everything we asked for we received. And the menu list was just as tasty as the description! We will be back! Gluten and dairy free options - best pizza Ever! Wait staff is efficient and friendly. Restaurant was spotless. Wine choices were fabulous. We can’t wait to go back! We have always found Star on Park to be great! The Classic Thin Crust is fabulous. Our food server was very attentive. We sat upstairs, which is a good place to people watch and look down at the main dining room. The restaurant is "lively", to say the least, but it has a really fun atmosphere. My family enjoys The Star on Park every time we go. We always get deep dish pizza and a large salad. The service, food and drinks are always great. This place was family friendly and great! Better than the star on Grand! Single pizzas maybe on the small side... but delicious. Our Italian pizza was absolutely delicious! I requested to be seated upstairs as I think it is a bit quieter up there. The pizzas and salads were good and the service was also good once we actually were seated correctly. I made a reservation on Open Table 6 days in advance and confirmed the reservation twice. Yet when we arrived, the wait staff did not seem to know about our reservation for a party if 6. We were first directed to a table for 2, I again said we were a party of 6. Then we were taken to a table for 4. Again I Saudi 6, not 4. A chair was added to the table to make it a small table for 5. Finally I dragged another table over and added another chair to make it work for a party of 6. This was annoying but the server we finally got was very good and the food was good too. Service was really slow, somewhat unusual. Little details were a bit down from our previous visits. For example, we asked for some bread for a party of 4, and they brought out 3 bread slices. I get that it was a busy night, but sometimes the details make the difference between fair and great service. I’ll still go because the food is great, but service could stand to improve especially during peak dinner times. 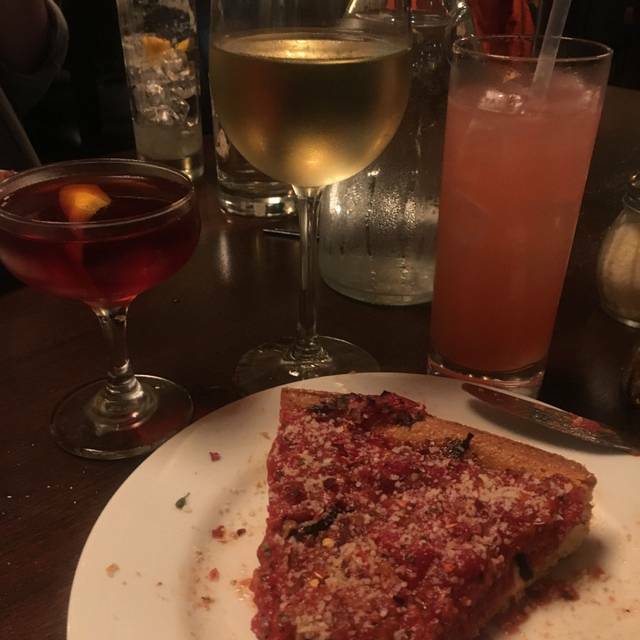 The Star on Park has amazing Deep Dish Pizza, with a lot of topping options for vegetarians and meat lovers alike. My wife and me go here once in 2 weeks and this time because of a bigger party at nearby table, the noise levels were higher and it wasn't the best experience. Also had to wait much longer than expected to get our second round of drinks. Took my daughter and 3 of her friends for her pre-concert birthday celebration. Girls enjoyed themselves. They called it “upscale”. Close to Oracle for the concert which is a plus. The food is always delicious, there is way more room than in Albany. The service was amazing. Our server was attentive without being intrusive, and had a lovely personality.